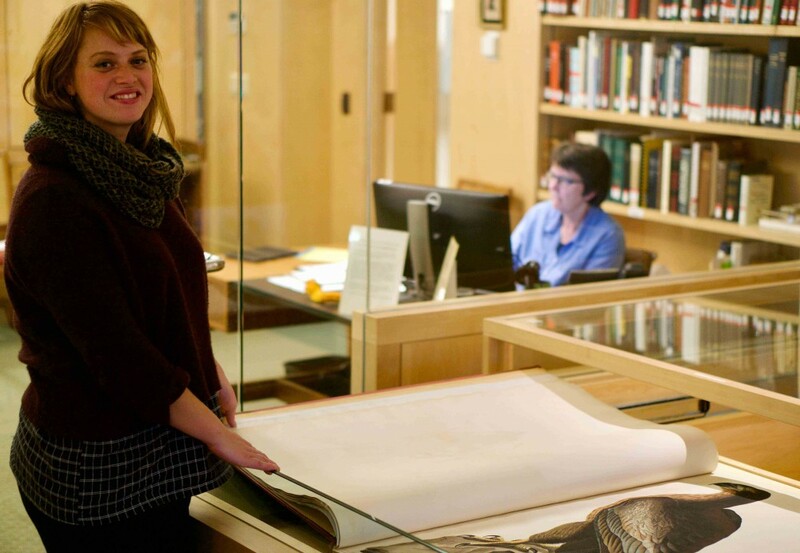 For the past year, a nearly 200-year-old, hand-colored edition of John James Audubon’s “The Birds of America” has been on display in Special Collections. A small crowd gathers on the first Friday of every month for a ceremonial page turning. Should the page-turning continue each month, it won’t be until the year 2052 that every page will have been displayed. The book, which depicts one species on each page, is so large that it requires two librarians to turn the pages. Once a month, Special Collections holds this ceremonial page-turning in the Reading Room. The 12th page-turning event will take place on Friday at 12:30 p.m. and will feature a short presentation by biologist Justin Schuetz ’94. Schuetz believes that the fusion of artistic and scientific talent represented in this rare edition of “The Birds of America” will draw a wide range of Bowdoin faculty, staff, students and community members to the page-turning. Much like “The Birds of America,” Schuetz’s career and passions straddle the worlds of art and science. After graduating from Bowdoin, he earned a Ph.D. in Ecology and Evolutionary Biology from Cornell University as well as a Masters of Fine Arts from the San Francisco Art Institute. A selection of his photographic work was displayed at Bowdoin during the 2015-2016 academic year. According to Special Collections Education and Outreach Librarian Marieke Van Der Steenhoven, a group of bird enthusiasts from the surrounding communities has consistently attended the page-turnings since the event debuted in January of this year. “There is starting to be a community around the page turning. I think it’s a fun way to come in and see something totally different and have an excuse to stop studying for a minute,” Van Der Steenhoven said. The event on Friday will reveal the bird to be on display for the month of December. Schuetz plans on discussing the biology of the species and the way in which that biology is depicted in Audubon’s art. Attendees of the event will receive a complimentary pin featuring the species of the month and will have the opportunity to explore a selection of books about birds that will be on display in the reading room. Van Der Steenhoven hopes that the page-turning will help expose members of the Bowdoin community to Special Collections. “I think that this department is a hidden treasure of the College,” she said.